Zhao Wei and Alec Su doesn’t look a day older than the two leads who are about 20 years younger. Zhao Wei sings the theme song for Alec Su‘s directorial debut The Left Ear starring Ou Hao, Chen Duling, Yang Yang, and Ma Sichun. The cast looks much better in character than expected. How many left ears can you count in this picture? Alec Su’s directorial debut The Left Ear. released its first glimpses of the female lead, a new song, and a new set of posters featuring the leads Ou Hao, Chen Duling, Yang Yang, Ma Sichun, Guan Xiaotong, Hu Xia, and Duan Bowen. The film airs on April 30th in an attempt to get a head start on Yang Mi and Huang Xiaoming’s You’re My Sunshine and Li Yu’s Ever Since We Love starring Fan Bingbing and Han Geng, which one do you see doing the best? Yang Yang is so pretty I want to see both of his ears. 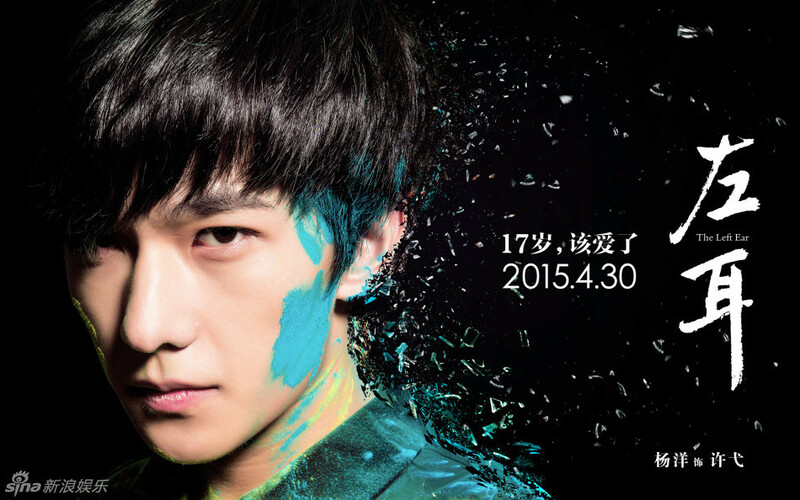 Ou Hao, Yang Yang, Hu Xia, and Duan Bowen are dunked in colorful paint for the latest set of character posters for The Left Ear. The Alec Su film is set to air on April 1st this year, and still haven’t released photos of its female lead. Alec Su tries to launch new actors like Ou Hao and Yang Yang to the success he once enjoyed. Once a youth icon himself, Alec Su revisits the popular themes of youths and high school once more in his directorial debut, The Left Ear 左耳. First glimpses of the mostly new male cast of Ou Hao, Yang Yang, Hu Xia, and Duan Bowen were released this week. Fun fact: Jiang Jinfu and Lin Gengxin were the cover models for the book before going into acting. How do you think the new cast compare?